This book is dedicated to the command and observation tanks of the German Army in World War Two. It deals with their history, operational use, organisation, special markings, technical description, serial numbers (when available), and data on the radio equipment. 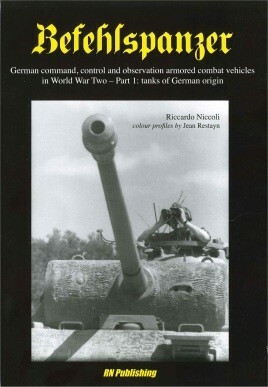 This book is dedicated to the command and observation tanks of the German Army in World War Two. It deals with their history, operational use, organisation, special markings, technical description, serial numbers (when available), and data on the radio equipment. The book is completed by some 105 colour profiles, produced by Jean Restayn, and by about 65 black and white historic photographs. A must for any enthusiast of the German military and of the Second World War, and a unique reference for all the serious modellers. ...the excellent illustrations do provide some valuable ideas for paintwork and markings. For modellers and historians interested in the Panzer forces of WW2 this will be an interesting addition to your reference shelf. A second volume is planned to cover those Command vehicles based on captured tanks, tank hunter, armoured cars and half-tracks. Judging by this first volume, that will be another one to look forward to.